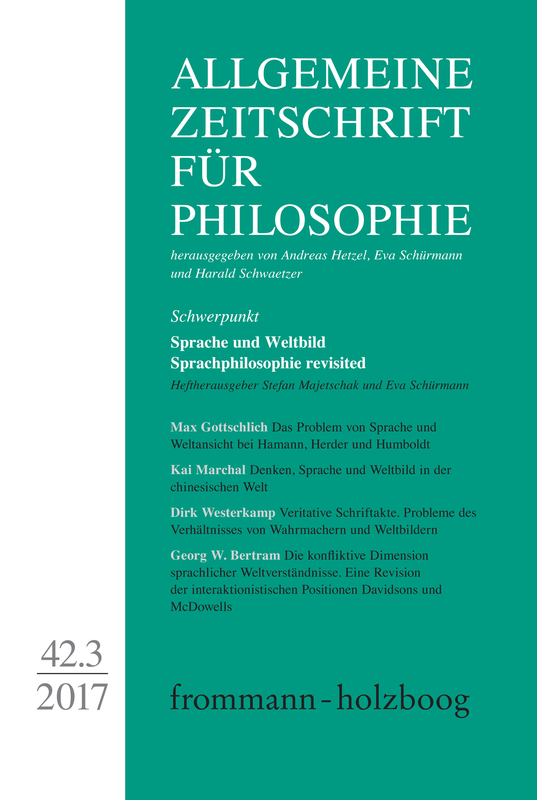 With contributions by Georg W. Bertram, Sarhan Dhouib, Max Gottschlich, Matthias Kroß, Ludwig Krüger, Stefan Majetschak, Kai Marchal, Eva Schürmann and Dirk Westerkamp. A proper understanding of the relation between language and »worldview« is based on the fundamental thought in Hamann’s, Herder’s and Humboldt’s contribution to understanding the nature of language, namely the concrete unity of language and thought. What does this mean and what systematic implications does this thought have? This paper provides a sketchy outline of the answers to these questions and deepens this with regard to Hamann, Herder, and Humboldt. This essay attempts to shed new light on the relation between language and world-view from the perspective of East Asia. Twentieth century European philosophers have often thematized the encounter with alien world-views and ways of living, and pondered on the multiplicity of human cultures. In the fields of hermeneutics, phenomenology and deconstruction, the alienness of the other even has become a sort of leitmotif for philosophers. And yet, the difference between the familiar and the alien has almost always been debated in the European languages of philosophy, not by directly engaging the philosophical and religious discourses of the other. In my essay, I want to re-think the relation between language and world-view by engaging with Chinese philosophical and religious discourses. This article analyses how different world views in the modern Arabic-Islamic context are in competition and conflict with each other. The article highlights the compatibility or incompatibility of a religiously influenced world view on the one hand, and a modern-scientific world view on the other. The conflict of world views becomes especially evident in the early works of the Syrian philosopher Sadiq Jalal al-Azm, who deploys a specific concept of criticism in a central way. Inspired by Cassirer and Bergson but also influenced by Islamic mysticism, al-Azm develops a critique of culture and society, which is accompanied by a critique of language. Throughout his writings, Wittgenstein offers his readers what might be called an »ethical contract« (in analogy to Lejeune’s »autobiographical contract«): work through philosophical problems, you will solve these problems and, in consequence, gain the »peace of mind«. In his early work Tractatus logico-philosophicus, though, this promise extends only to »his reader« who acknowledges the truth of his ideas to be »unassailable and definitive«, i. e. the reader who understands him. Later, Wittgenstein devises a radically reader-oriented case-by-case strategy in order to open up the therapeutic circle of understanding to any philosophically minded reader replacing the concept of truth by that of sense. It aims to (dis-)solve all readers’ philosophical problems by leading them out of the »fly glass« of their world view in which they are captive. Wittgenstein’s search for philosophical clarity therefore may be regarded not only as an end in itself but also as a way to honour the ethical pledge he makes to his readers. Within Late Wittgenstein’s Philosophy, »Weltbild« denotes our implicit »system of verification«, consisting of an inferential network of rules, practices and general beliefs. This article seeks to highlight some of the philosophically controversial aspects in Wittgenstein’s »Weltbild«-conception of verification. It discusses scope and limits of some of the scriptural forms of verification, validation and corroboration: Protocols, Testimonia, Operativa. Accordingly, the systematical role of these »veridical scripture acts« is examined within the context of truthmaking. An Alethic Pragmatism, however, willing to take into account the varieties of truthmaking-procedures, can not ignore the epistemic conditions of »doing truth«. The article concludes that the illocutionary force of veridical scripture acts is systematically depending on the forms and ideals of stating facts. The paper puts forward a criticism of two interdependent aspects of Donald Davidson’s and John McDowell’s respective philosophies of language. On the one hand, I criticize the notion that successful communication can be treated as the starting point for explaining the social dimension of linguistic meaning. On the other hand, I deal with the problematic way in which the authors seem to claim that language’s openness to the world, which for them explains its relationship to the world in general, can be taken for granted. As for the social dimension of language, I argue that conflict – and not instances of successful communication – should be seen as the rule in the constitution of linguistic meaning. This revised understanding of language’s irreducible sociality lays the groundwork for a reconception of language’s relation to the world: in linguistic practices, we always have to engage in a struggle to open up linguistic structures to the world, such that language’s relation to the world cannot be taken for granted when thinking about the significance of the fact that language has any meaning at all.